Saturday, May 1st I was at an amazing seminar. It was awesome. 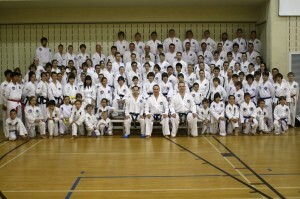 There were over 50 color belts and over 60 black belts men and women up to 5th degree. It all started Saturday morning at 3:00 am when my alarm clock rudely woke me up from my beauty sleep. 🙂 Fortunately, all I had to do was hop in the back seat of my car and continue to sleep while my mom drove. We got to in Trois-Rivières early enough for me to grab some breakfast since we had to be at the gym by 8:00 am. 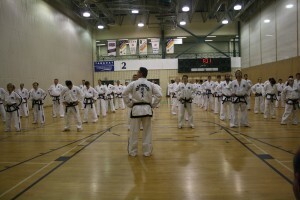 When we arrived at the university of Quebec Trois-Rivières campus, it was cool to be in the gym since I knew just about everyone there (at least most of the black belts). People traveled from all over Quebec and Ontario and some even came from the States. 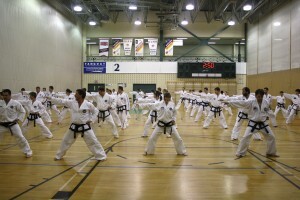 The seminar was broken up into three training periods. One for patterns, one for Sparring, and one for board breaking. 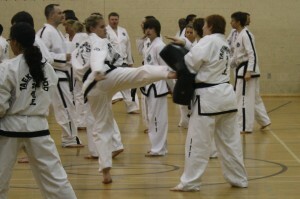 Each training session was approximately 2 and a half hours long. 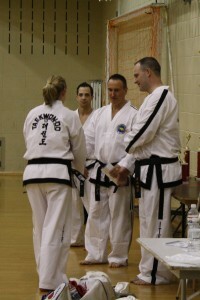 They separated the colored belts from the black belts and then we were sent off to the different sections. 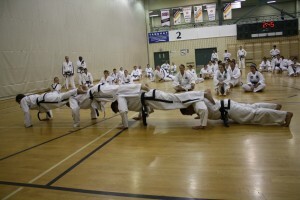 The black belts started with the board breaking session which was given by my own instructor, Mr. Steven LeGrow . 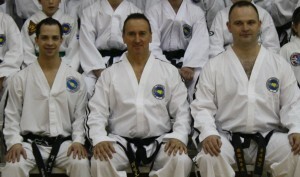 Mr. LeGrow was the Bronze medalist for both patterns and sparring at the last World Championships. The main idea and goal was to isolate and work certain muscles to develop strength. We were learning how to use our body`s power to its full potential. Mr. LeGrow said that his goal was to make it so that we couldn`t last for the rest of the day. It worked 🙂 After the 2 1/2 hours my legs were burning bad! We were all line up in rows and did patterns together. Master Laquerre walked up and down the rows and if he saw you make any little mistake he tapped you on the shoulder and you had to sit down. I was getting more and more determined as people were being eliminated. Eventually there were only 8 people left standing. I was one of them. Then there was a tournament format for the last 8 people to have a round robin. I had to go up three times against people I’ve never competed against. Finally it was down to just me and Maxine Noel for 1st and 2nd place. 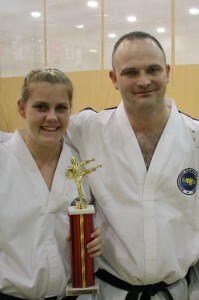 Last year she represented Canada in Argentina at the World Championships. Lately we always seem to end up going against each other. Sometimes she wins and sometimes I win. This time she beat me. I love having someone who really pushes me to train hard. I was just happy to make it that far in a room with so many extremely skilled and experienced people. Finally we ended off with the sparring session. At this point everyone`s legs were shaking and our feet were in so much pain from stomping on a wooden floor all day in bare feet. You just wanted to sit down, but if you did it was really hard to get back up :). We did some combination drills and mostly worked on strategy and movement in certain situations. Mr. Maxime Bujold was the man running this session and he was a World Champion in sparring. This guy was the real deal. He was so smart and impressive to listen to even though the whole thing was completely in french. I was quite proud of myself for actually understanding what he had to say. It’s kinda weird learning all these drills knowing that you will be all using them against each other in the next tournament. I would never share all my soccer or basketball drills with my direct competitor. That is the unique thing about TKD. 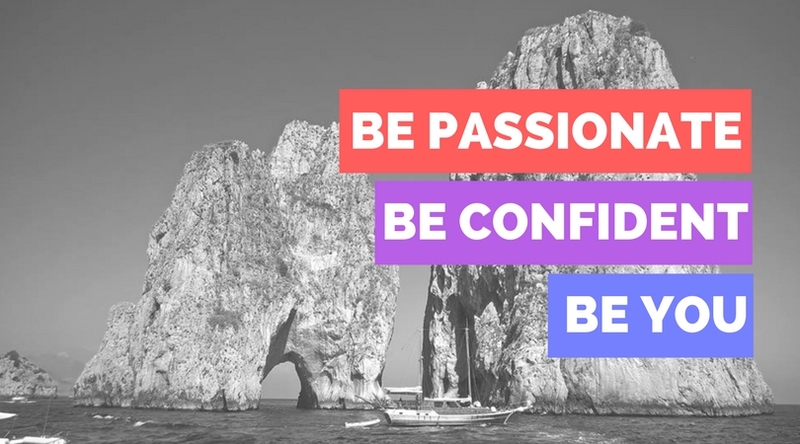 Everyone is just there for improvement. To end of the night a large group of us from all different schools went out for a pasta dinner. It was so nice to just kick back and talk about the day. I was exhausted physically and mentally from all the concentration!!! I couldn’t wait to get back home but we still had another 4 hour car ride. We didn’t leave until 10:00 pm. Once again, I got to sleep while my dad drove us home. It would have been nice to stay at the hotel with everyone else since they were all heading for the hot tubs but I had to get together with a school friend first thing Sunday morning to work a project together and then I had soccer practice Sunday night.